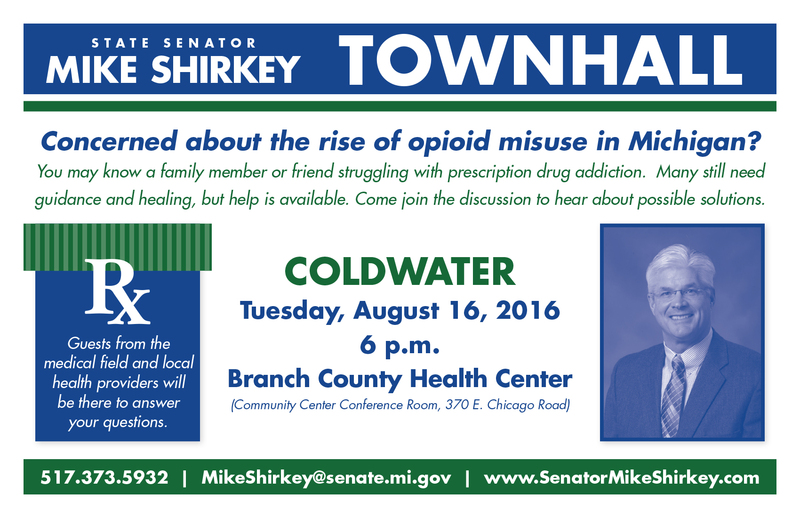 LANSING, Mich. — State Sen. Mike Shirkey is encouraging residents of Branch County concerned about the rise of opioid misuse to attend a public town hall on Tuesday, Aug. 16 in Coldwater for a discussion about possible solutions to the problem. Guests from the medical field and local health providers will be on hand to answer questions. Anyone interested in the issue. A public town hall meeting to discuss possible solutions to the problem of opioid misuse. Note: Click the image for a print-quality version.